Jonathan Mayhew Wainwright IV (August 23, 1883 – September 2, 1953) was a career American army officer and the Commander of Allied forces in the Philippines at the time of their surrender to the Empire of Japan during World War II. Wainwright was a recipient of the Medal of Honor for his courageous leadership during the fall of the Philippines. Wainwright, nicknamed "Skinny" and "Jim", was born at Fort Walla Walla, an Army post now in Walla Walla, Washington, and was the son of Robert Powell Page Wainwright, a U.S. Army officer who was commissioned a 2nd Lieutenant in the 1st Cavalry in 1875, commanded a squadron at the Battle of Santiago de Cuba during the Spanish–American War, and in 1902 was killed in action in the Philippines. His grandfather was Lieutenant Jonathan Mayhew Wainwright II, USN, who was killed in action during the Civil War. Congressman J. Mayhew Wainwright was a cousin. He graduated from Highland Park High School in Illinois in 1901 and from West Point, in 1906. He served as First Captain of the Corps of Cadets. Wainwright was commissioned in the cavalry. He served with the 1st Cavalry Regiment (United States) in Texas from 1906 to 1908 and in the Philippines from 1908 to 1910, where he saw combat on Jolo, during the Moro Rebellion. Wainwright graduated from the Mounted Service School, Fort Riley, Kansas, in 1916 and was promoted to Captain. By 1917, he was on the staff of the first officer training camp at Plattsburgh, New York. In February 1918, he was ordered to France, during World War I. In June, he became assistant chief of staff of the U.S. 82nd Infantry Division, with which he took part in the Saint Mihiel and Meuse-Argonne Offensives. As a temporary lieutenant colonel, he was assigned to occupation duty in Germany with the 3rd Army at Koblenz, Germany, from October 1918 until 1920. Having reverted to the rank of captain, he was then promoted to major. After a year as an instructor at the Cavalry School at Fort Riley, he was attached to the general staff from 1921–23 and assigned to the U.S. 3rd Cavalry Regiment, Fort Myer, Virginia, from 1923-25. In 1929, he was promoted to lieutenant colonel and graduated from the Command and General Staff School, Fort Leavenworth, Kansas, in 1931, and from the Army War College in 1934. Wainwright was promoted to colonel in 1935, and served as commander of the 3rd Cavalry Regiment until 1938, when he was promoted to brigadier general in command of the 1st Cavalry Brigade at Fort Clark, Texas. In September 1940, Wainwright was promoted to major general (temporary) and returned to the Philippines, in December, as commander of the Philippine Department. As the senior field commander of Filipino and US forces—under General Douglas MacArthur—Wainwright was responsible for resisting the Japanese invasion of the Philippines, which began in December 1941. On December 8, 1941, he commanded the North Luzon Force, comprising three reserve Filipino divisions and the 26th Cavalry Regiment (Philippine Scouts). Retreating from the Japanese beachhead of Lingayen Gulf, Allied forces had withdrawn onto the Bataan Peninsula and Corregidor by January 1942, where they defended the entrance to Manila Bay. Following the evacuation of MacArthur to Australia in March to serve as Allied Supreme Commander, South West Pacific Area, Wainwright inherited the unenviable position of Allied commander in the Philippines. Also that March, Wainwright was promoted to lieutenant general (temporary). On April 9, the 70,000 troops on Bataan surrendered under the command of Major General Edward P. King. On May 5, the Japanese attacked Corregidor. Due to lack of supplies (mainly food and ammunition) and in the interest of minimizing casualties, Wainwright notified Japanese General Masaharu Homma he was surrendering on May 6. Wainwright at the same time sent a coded message to Maj. Gen. William F. Sharp, in charge of forces on Mindanao naming him as commander of all forces in the Philippines, excepting those on Corregidor and three other islands in Manila Bay. Sharp was now to report to Gen. MacArthur, now stationed in Australia. This was to cause as few troops as possible to be surrendered. Homma refused to allow the surrender of any less than all the troops in the Philippines and considered the troops on and around Corregidor to be hostages to ensure other forces in the Philippines would lay down their arms. Wainwright then agreed to surrender Sharp's men. Gen. Sharp was placed in a difficult position. He knew if he ignored Wainwright's wish for him to surrender that the hostage troops and civilians at Corregidor could be massacred. Though his troops were badly mauled, they could still put up a fight. It had been expected they would fight on as a guerrilla force. In the end, on May 10 Sharp decided to surrender. 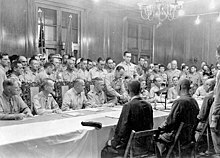 Sharp's surrender proved problematic for the Japanese, although Sharp and many of his men surrendered and suffered as prisoners of war until liberated in 1945. Many of Sharp's men, the vast majority of them Filipino, refused to surrender. Many considered Wainwright's surrender to have been made under duress and many ultimately joined the guerrilla movement led by Colonel Wendell Fertig. By June 9, Allied forces had completely surrendered. 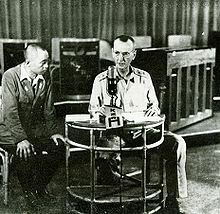 Wainwright was then held in prison camps in northern Luzon, Formosa, and Liaoyuan (then called Xi'an and a county within Manchukuo) until his liberation by the Red Army in August 1945. He was the highest-ranking American POW, and, despite his rank, his treatment at the hands of the Japanese was no less unpleasant than most of his men. When he met General MacArthur in August 1945 shortly after his liberation, he had become thin and malnourished from three years of mistreatment during captivity. After witnessing the Japanese surrender aboard the USS Missouri on September 2, together with Lieutenant-General Arthur Percival, he returned to the Philippines to receive the surrender of the local Japanese commander, Lieutenant-General Tomoyuki Yamashita. Wainwright (right) and MacArthur greet, August 1945. Dubbed by his men a "fighting" general who was willing to get down in the foxholes, Wainwright won the respect of all who were imprisoned with him. He agonized over his decision to surrender Corregidor throughout his captivity, feeling that he had let his country down. Upon release, the first question he asked was how people back in the U.S. thought of him, and he was amazed when told he was considered a hero. He later received the Medal of Honor, an honor which had first been proposed early in his captivity, in 1942, but was rejected due to the vehement opposition of General MacArthur, who felt that Corregidor should not have been surrendered. MacArthur did not oppose the renewed proposal in 1945. Rank and Organization: General, Commanding U.S. Army Forces in the Philippines. Place and date: Philippine Islands, 12 March to 7 May 1942. Entered Service at: Skaneateles, N.Y. Birth: Walla Walla, Wash. G.O. No. : 80, 19 September 1945. Distinguished himself by intrepid and determined leadership against greatly superior enemy forces. At the repeated risk of life above and beyond the call of duty in his position, he frequented the firing line of his troops where his presence provided the example and incentive that helped make the gallant efforts of these men possible. The final stand on beleaguered Corregidor, for which he was in an important measure personally responsible, commanded the admiration of the Nation's allies. It reflected the high morale of American arms in the face of overwhelming odds. His courage and resolution were a vitally needed inspiration to the then sorely pressed freedom-loving peoples of the world. On September 5, 1945, shortly after the Japanese surrender, Wainwright was promoted to four-star General. On September 13, a ticker-tape parade in New York City was held in his honor. Upon returning to the United States, he was assigned as Commander of Second Service Command and the Eastern Defense Command at Fort Jay, Governors Island, New York. In January 1946, he became the Commander of the Fourth Army at Fort Sam Houston, Texas, where he retired in August 1947. He became a Freemason in May 1946 at Union Lodge No. 7. in Junction City, Kansas, and a Shriner soon after. Wainwright was a Hereditary Companion of the Military Order of the Loyal Legion of the United States by right of his grandfather's service in the Union Navy during the Civil War. He served on the board of directors for several corporations after his retirement. He made himself available to speak before veterans' groups and filled almost every request to do so. He never felt any bitterness toward MacArthur for his actions in the Philippines or MacArthur's attempt to deny him the Medal of Honor. In fact, when it appeared that MacArthur might be nominated for president at the 1948 Republican National Convention, Wainwright stood ready to make the nominating speech. He died of a stroke in San Antonio, Texas on September 2, 1953, aged 70. Fort Wainwright in Alaska is named for him. A street, Wainwright Drive, was named after him in Pittsburgh, Pennsylvania. There is a street, Wainwright Drive, in El Paso, Texas named after Jonathan Wainwright, as was also an elementary school in the El Paso Independent School District; Wainwright Elementary School opened in 1949 and was closed and placed on reserve status in 2005 in light of the expansion of Fort Bliss through BRAC. It currently serves as a science education resource center; until November 2009; it also served as a student health center. The Veterans Hospital in Walla Walla, Washington is the Jonathan M. Wainwright IV Medical Center. There is a memorial to General Wainwright on Corregidor Island. There is a Wainwright Street located in the Twinbrook section of Rockville, Maryland. There is a Wainwright Drive in San Jose, California. There is a Wainwright Avenue in Closter, New Jersey. There was a Wainwright High School in Tainan, Taiwan. It was a school for Americans and had been closed in the 1970s. The Jonathan M. Wainwright Award is named in his honor at the Freemasonic National Sojourners Marvin Shields Camp Heros of '76, Olympic Chapter No. 539 and is awarded yearly. There is a General Wainwright Drive in Lake Charles, Louisiana. There is a housing area on Fort Hood, Texas, called Wainwright Heights. In the film MacArthur (1977), Wainwright was portrayed by Sandy Kenyon. Wainwright, Jonathan M.; Robert Considine (1986) . General Wainwright's Story. New York: Bantam. ISBN 0-553-24061-7. ^ "Deaths: J. Mayhew Wainwright". The Living Church. Milwaukee, WI: Morehouse-Gorham Co.: 22 June 17, 1945. ^ Kingseed, Cole Christian (2006). Old Glory Stories: American Combat Leadership in World War II. Naval Institute Press. p. 56. ISBN 9781591144403. Retrieved December 7, 2013. ^ Tyler, Floyd E (1967). How Far That Little Candle... Sioux Falls, South Dakota: Midwest Beach, Inc. p. 15. ^ Louis Morton The Fall of the Philippines (Washington: Center of Military History, United States Army, 1953), 2016 update, pp. 564-70. ^ Litovkin, Viktor (2005-05-09). "Saving General Wainwright". RIA Novosti. Retrieved 2009-04-11. ^ a b Murphy, E. Heroes of WW II (1990), pp 32–34. ^ Sterner, C. Douglas. "Family Feud – A Tale of Two Generals". Pueblo, Colorado. ^ "Medal of Honor recipients World War II (T–Z)". United States Army Center of Military History. Archived from the original on 2009-12-31. Retrieved 2009-04-06. ^ Wainwright, Jonathan; William R. Denslow; Forward: Harry S. Truman. 10,000 Famous Freemasons; 1957 Edition. Volume 4: Q-Z: Macoy Publishing. pp. 405–06. ^ Wainwright, Jonathan; William Denslow; Macoy publishing. "Online Scanned Copy of 10,000 Freemasons". Volume 4, 1957 Edition. Phoenixmasonry.org. Retrieved July 31, 2012. ^ Wainwright, General Jonanthan. "Grand Lodge of Kansas-Masons". Masons of Kansas. kansasmasons.org. Retrieved July 30, 2012. ^ "Wainwright In Semi-Coma. War Hero Suffers 2d Stroke in San Antonio Hospital". New York Times. September 2, 1953. Retrieved 2015-12-05. ^ "Service for Wainwright. Cavalryman's Rites in Texas to Precede Arlington Burial". New York Times. September 4, 1953. Retrieved 2015-12-05. ^ "U.S. Army Recruiting Command Brigade and Battalion Public Affairs Offices" (PDF). Recruiting Command. U.S. Army. March 16, 2009. Retrieved September 9, 2009. ^ "府城美國學校夷平逾30年 市府將立碑紀念". Epoch Times. March 25, 2009. Retrieved May 23, 2018. ^ Staff. "Photos and Floor Plans". Directorate of Public Works, FORT HOOD, TX. United States Army. Retrieved August 18, 2014. Lozano, Madison (January 12, 2014). "Fort Hood housing offers security, sense of community". Killeen Daily Herald. Retrieved August 18, 2014. ^ Gerard Molyneaux (1995). Gregory Peck: A Bio-bibliography. Greenwood Publishing Group. p. 184. ISBN 978-0-313-28668-1. Robert J. Lentz (8 January 2003). Korean War Filmography: 91 English Language Features through 2000. McFarland. p. 197. ISBN 978-0-7864-3876-1. "Jonathan Mayhew Wainwright IV: General, United States Army". Arlington National Cemetery. 21 October 2005. Retrieved September 29, 2010. Murphy, Edward (1990). Heroes of WW II: True Stories of the Men Who Earned Our Nation's Highest Award. New York: Ballantine Books. ISBN 0-345-37545-9. OCLC 25056385. Schultz, Duane (1981). Hero of Bataan: The Story of General Jonathan M. Wainwright. New York: St. Martin's Press. ISBN 9780312370114. OCLC 7573956. Wikimedia Commons has media related to Jonathan M. Wainwright IV. This page was last edited on 18 December 2018, at 06:04 (UTC).